Item Description Manuscript of Skinner's Bruce's March, in Gavin Greig's hand, so precise and clear, that the note stems could almost have been made with a ruler. To be played Boldly, the tempo is 112, slightly slower than two marching paces per second. The simple accompaniment consists mostly of octave quavers in the bass. 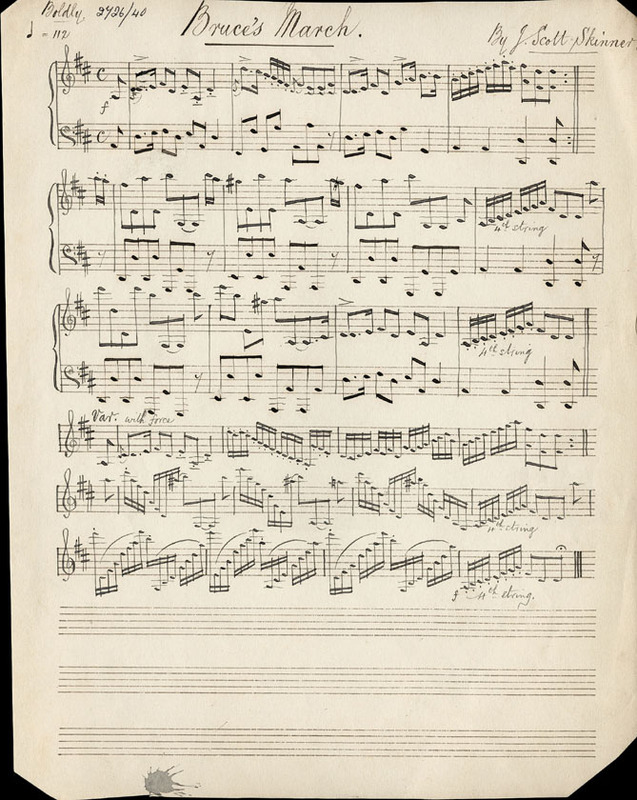 The single virtuoso variation, 'Var. with force', takes up the remaining three single staves. King Robert the Bruce (the title in Skinner's Scottish Violinist, 1900) was Robert I, Earl of Carrick (1274-1329). Bruce had a famous victory against Edward II (the 'Hammer of the Scots') at Bannockburn, near Stirling, in 1314. The character of Bruce appears alongside William Wallace (the 'Scottish Patriot') in the Oscar-winning 1995 film 'Braveheart'.